The babies, Gailai and Bailai are adorable, smiling and laughing, trying to talk. They’re just like most babies, until you notice their feet, and the tank of water in which they live, and the tiny gills under their arms. They are the children of Abasio and Xulai. They are the first generation of hybrids destined to save mankind from extinction when the waters cover Earth. Oh, it won’t happen right away. Not for a couple of hundred years. So there is plenty of time, and Abasio and Xulai are traveling to villages introducing folk to these charming children and convincing them to undergo the metamorphosis that will enable them to produce children like these. Of course, there are those folk who view these children as abominations and would destroy them given the chance. Abasio and Xulai must be quite careful in their choice of villages. This is the third book of a trilogy, Plague of Angels and Waters Rising being the other two. It’s not vital to have read Waters Rising, but it would be helpful. Plague of Angels was published in 1993, and although I have read it, nothing of it remains in my memory. 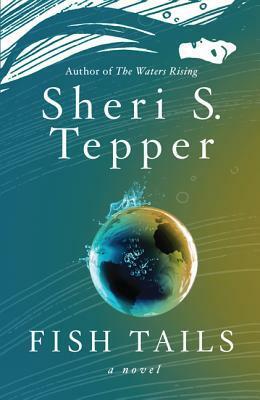 I have enjoyed Sheri Tepper for many years and am accustomed to her blending of science fiction and fantasy and satire and any other genre that strikes her fancy. It may be an acquired taste, so I suggest that this book be read with an open mind.